The 1911 is the quintessential "classic" semi-auto pistol. It is a single-action, semi-automatic, magazine-fed, and recoil-operated handgun which uses a .45 ACP cartridge. The weapon was designed by John M. Browning during the 1890s, the result of a search for a suitable self-loading (or semi-automatic) handgun to replace the variety of revolvers then in service. It was the standard-issue side arm for the United States armed forces from 1911 to 1985 and is still carried by some U.S. forces. It was widely used in World War I, World War II, the Korean War, and the Vietnam War. In total, the United States procured around 2.7 million 1911 pistols in military contracts during its service life. The 1911 was replaced by the M9 pistol as the standard U.S. sidearm in the early 1990s. 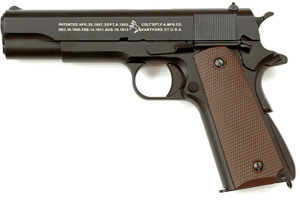 The 1911 is the best-known of John Browning's constructions to use the short recoil principle in its basic design. Besides the entire pistol being widely copied, this operating system rose to become the preeminent type of the 20th century and of nearly all modern centerfire pistols. 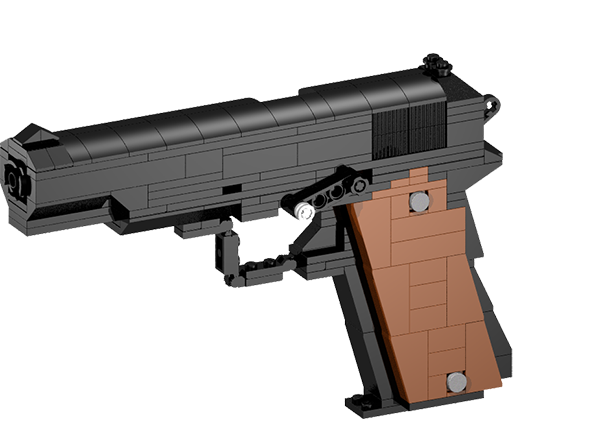 The BrickGun 1911 is easily our most complex model to date in terms of combining a complicated form factor with the incorporation of our standard mechanical elements. 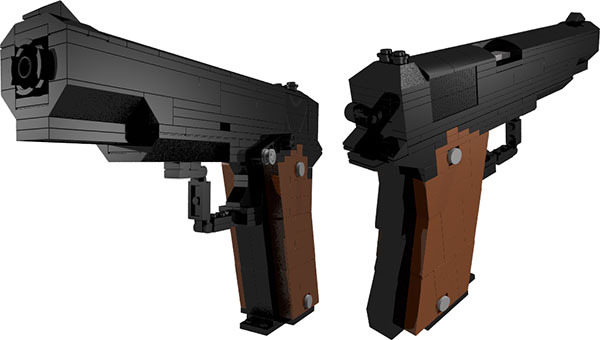 Our 1911 includes a working (and uniquely-designed) trigger system, functioning hammer, moving slide and slide lock, continuing our tradition of creating the ultimate full-scale handgun model made from plastic building bricks. The design of the 1911 has taken years to refine, going through numerous iterations before we felt we had finally done proper service to an American classic. We struggled over every possible detail, while refusing to compromise on the integration of working mechanics. 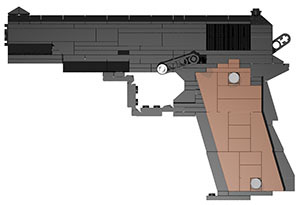 We go through this process with all of our models, but due to the unique and iconic shape of the 1911 we were left with very little internal space to place the working trigger, hammer, and slide. PLEASE NOTE: Due to the complexity of this model it is recommended for very experienced builders only.